German technology is synonymous with excellence, including luxury cars enjoyed throughout the world. That technical expertise extends into the gambling industry as well thanks to the German company Merkur. Above all else, Merkur specializes in slot machines, originally for land-based casinos but now for online casinos as well. The company has earned a reputation for excellence at home, throughout Europe and even beyond European borders. Merkur now has more than 150 unique online game titles in its library. Most of the games that Merkur makes are available in a few select casinos online, but you’ll also find them in one of the biggest arcade chains in Germany. What stands out most about Merkur’s game portfolio is innovative design, distinctive graphics and a willingness to change up the design approach from one game to the next. Whatever your personal tastes, you’ll find something Merkur makes that will entertain you. The company also does a great job of catering to casuals and beginners as well as it does high-rollers. Merkur was founded in 1957. There were not many software manufacturers in Germany back then, and even now as Merkur closes in on its 60th anniversary, the company helps set the bar for the local industry. The company originated as a small, family business, and that likely helped its success. The bosses were on-site working with everyone else, and all training took place on-site as well. Even as the company began experiencing tremendous success, the owners were there working, innovating and putting their distinctive stamp on the games that the company created. Paul Gauselmann, the man who created the company, is still there today. His company has expanded to more than 8,000 employees, and there are hundreds of Merkur-branded casinos in Germany. The German government even honored Gauselmann with an Order of Merit due to his innovation. Merkur has also created a foundation that provides aid to socially disadvantaged children and adolescents. Merkur is also involved in a number of other charitable efforts, and it has always been a focus of this company to use its success to benefit others as well as its immediate family. Despite the great success of the brand and even the industry awareness beyond German borders, it’s unfortunate that so many slot fans throughout the world do not know the Merkur name. That is in large part due to the brand’s focus on local casinos and the slow transition to the online space. At one point, Merkur resisted this new market because it feared that an online presence would diminish its reputation. A dark side of the Internet gambling industry is the disreputable brands, and Merkur feared being associated with those. When the good brands far outnumbered the bad and the future of the industry became undeniable, Merkur shifted gears. Although a latecomer, Merkur experienced immediate success and growing acceptance among players worldwide. Despite this online venture, the company focus continues to be multi-game machines for casinos, pubs and other establishments. Many of the physical Merkur machines have dual screens and an emphasis on realism in terms of graphics and sound effects, and millions of people have enjoyed these experiences over the years. As the company breaks ground in the online arena, there are at least two notable sites at which people can experience these games. The most recognized of these providers is Sunmaker Casino, which does a great job of positioning Merkur games with lucrative bonuses for high visibility. Already, Merkur has an impressive library online. It features more than 150 unique games, and many of those are slot machines. The company has done a great job delivering a versatile lineup early on. Users will find games of various layouts and configurations. In addition to video slot games, Merkur also provides a solid selection of classic slot games. There are a number of three-reel fruit machines to choose from but also old-school games with a twist, such as Double Triple Chance. Merkur has numerous slots with five reels and innovative features, but sheer diversity of classics is one way the brand can really shine, and that’s a reflection of the great success the company has enjoyed over the last six decades. The focus at Merkur will always be slot machines, but that doesn’t mean that Merkur creates slot machines exclusively. Online casinos like Sunmaker require game diversity, and Merkur can deliver in this regard as well. Merkur offers a small but well-manicured selection of classic casino games, including baccarat, blackjack, craps, roulette and so forth. In fact, some of the innovations Merkur has made with online roulette are now being embraced by casino software developers throughout the world. 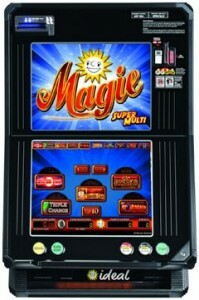 Merkur also makes video poker machines, fixed-odds games and evens specialty games like Sic Bo. All of these games bear the quality and attention to detail that have made Merkur slots so beloved over the years.